If you have any questions regarding Worldmapper, please go to the FAQ which should answer most of the inquiries that we receive. We may not be able to reply to all individual emails that we get, so please check the FAQ or read the automated reply when emailing us. That will clarify most issues that we get frequently asked. The work on a Leverhulme Trust-funded three-year postgraduate research project on the improvement of the visualisations of the worldmapper project is now completed. 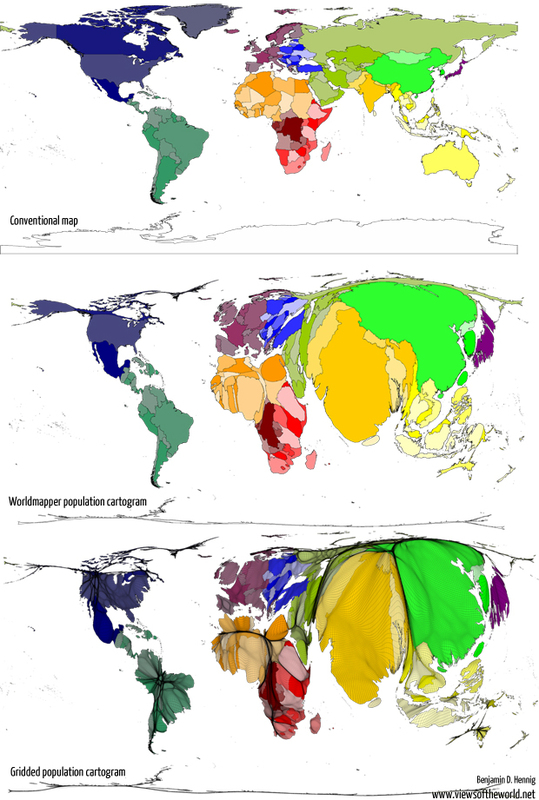 The PhD thesis by Benjamin Hennig explains the creation of gridded cartograms, which have also been integrated in the Worldmapper website in form of the gridded population cartograms in the online World Population Atlas. The thesis explains the technique, presents a number of examples and case studies and discusses the implications for cartographic practice and potential wider applications. 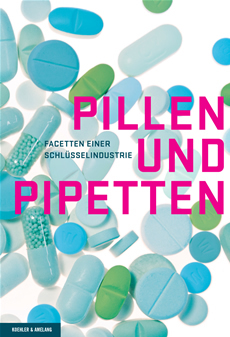 The work is now available as a book (published 2013 by Springer). The current issue of the German-language academic journal Wissenschaft & Frieden, a publication dealing with issues related to peace research, looks at the theme of international geopolitics. 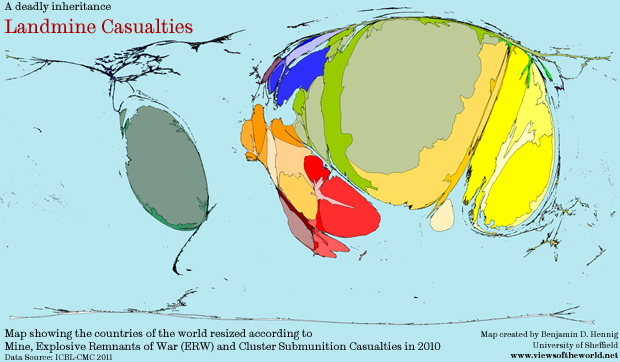 For a contribution in that issue we created a series of updated maps of various relevant topics, including a new look at the global military expenditure according to the most recent data by the Stockholm International Peace Research Institute. 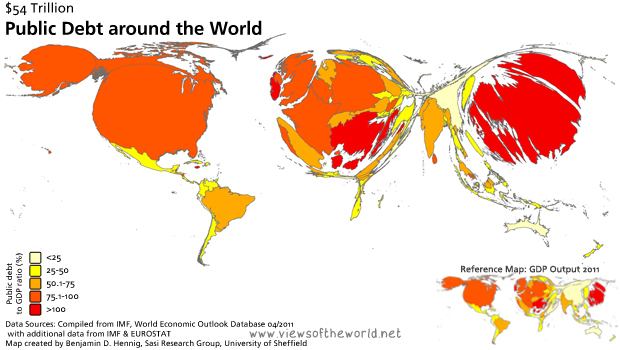 A blog post on Views of the World explains the evolution of Worldmapper explaining the differences between a conventional map and the different types of cartograms used in the Worldmapper project. A paper published in the European Journal of Social Sciences (Vol. 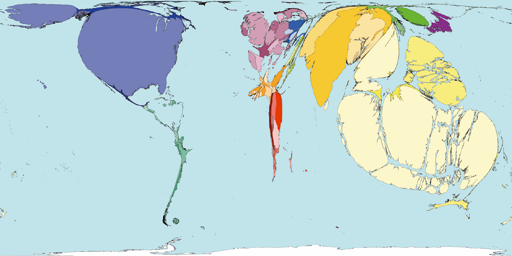 24, Issue 3) shows a new world map of organic agriculture that presents countries as proportional in size to their share of the total of world organic hectares. The International Publishers Association (IPA) made a report on the development of the international publishing markets using a new approach to estimating the size of publishing markets based on market value by consumer prices. For the report we created a map from their new data estimates. 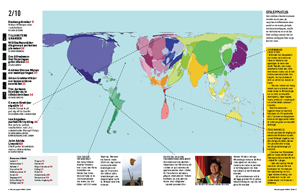 In the last of our 2012 Olympic/Paralympic map series we completed the medal maps with a look at the success of the partiocipating nations at the 2012 Paralympics. 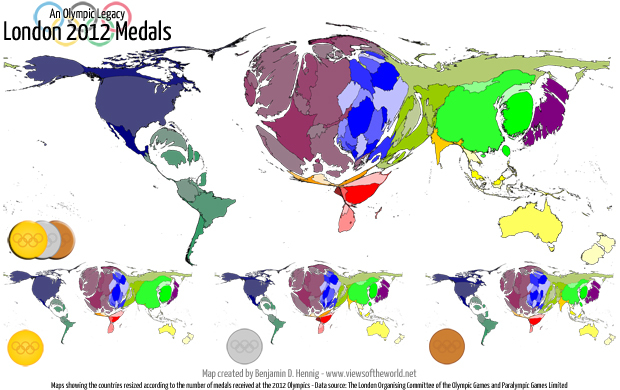 We also looked back and created a map animation comparing the Olympic and Paralympic medal distributions. 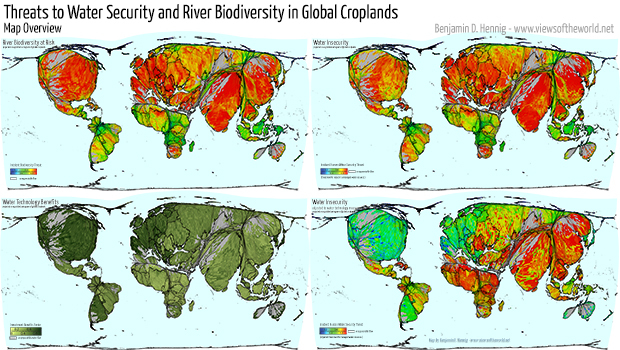 As part of a contribution to the 48th Annual Conference of the Society of Cartographers we presented a map series that looks at the distribution of agricultural lands. We used these maps to demonstrate how issues of water insecurity can be visualised in alternative ways. 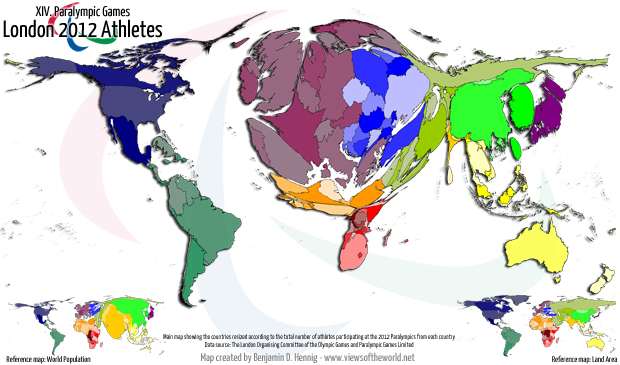 Adding to our Olympic mappings, we created a cartogram of the countries of origin of the participating athletes at the 2012 Paralympic games. 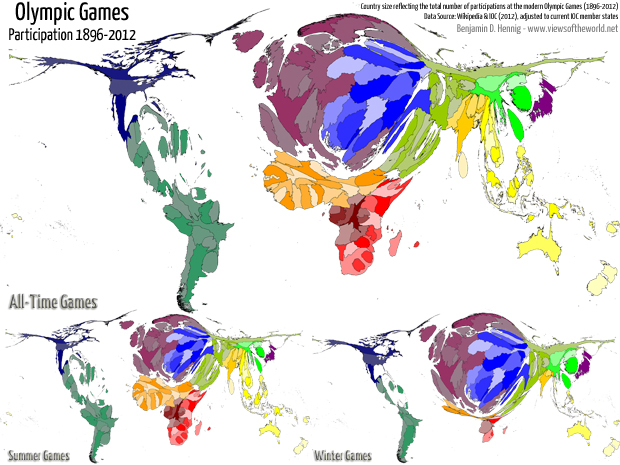 A series of six maps visualising all-time statistics from the modern-era Olympics since 1896 concludes our cartographic view of the games. The overall picture of Olympic success stories is of little surprises when seen from a perspective of won medals. Olympic inequalities already started with an imbalance of participating athletes from around the world (as shown our earlier map, see below) which hardly reflects the global population distribution. That pattern is carried forward to the winner’s podium, where in large the wealthier parts of the world are represented, as our cartograms of the final results shows. 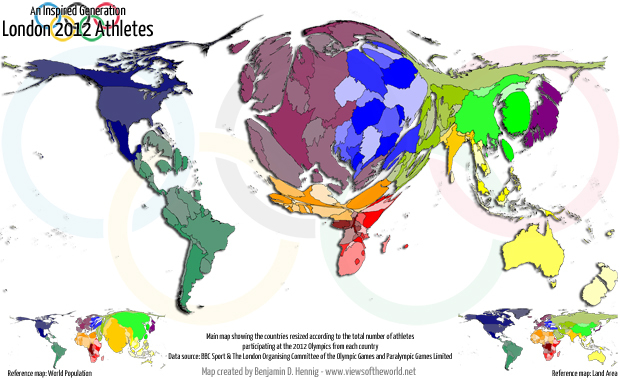 With the opening of the 2012 Summer Olympics in London we looked at the countries that the over 10,000 participating athletes are coming from. The map shows that the Olympics are not a fully fair game in terms of equal representation of the world, but instead also reflects the capabilities of countries to participate in such a global event. 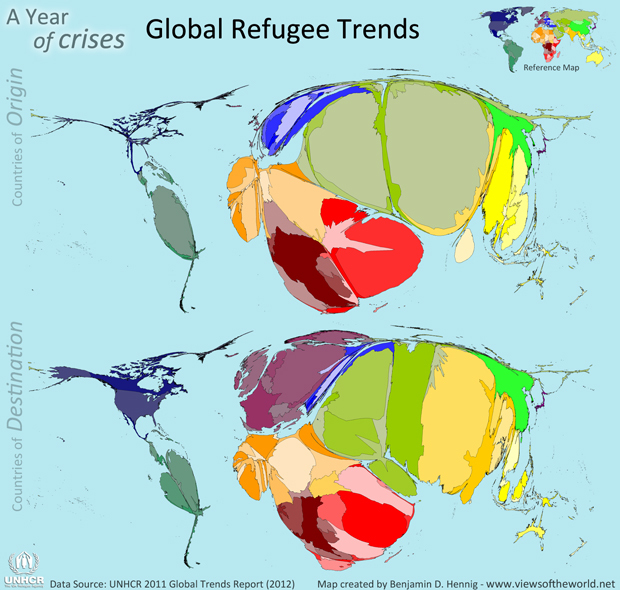 UNHCR have released their latest report on the situation of refugees. On Worldmapper, we have mnapped this topic before, but released an updated version to these maps now using the report's latest data. A new report by Save the Children identifies the final fifth of unimmunised children and why they aren’t being reached. Worldmapper contributed some of the maps featured in the report, highlighting the prevailing inequalities in access to health care across the globe. As part of a Plenary Speech at the AAG Annual Conference in New York City we showed a new map that has been made in collaboration with the Globaia project. 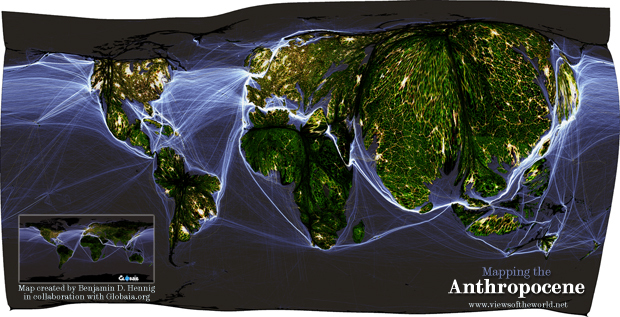 Aim of the project is a new cartography of the Anthropocene, which stands for the considerable impact of humans on the environment since industrialisation started. 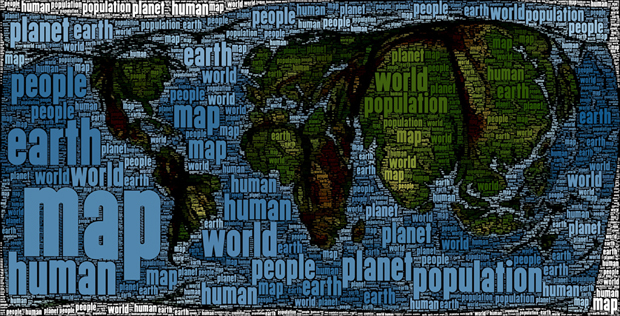 The wWorldmapper-version of Globaia's signature map shows some of the key elements of human interaction on the planet on an equal population projection. For the German magazine AKTIV we took a closer look at the changing shares of exports from Germany between 1991 and 2011 using Worldmapper cartograms. The world population is estimated to cross the 7 billion line this month. 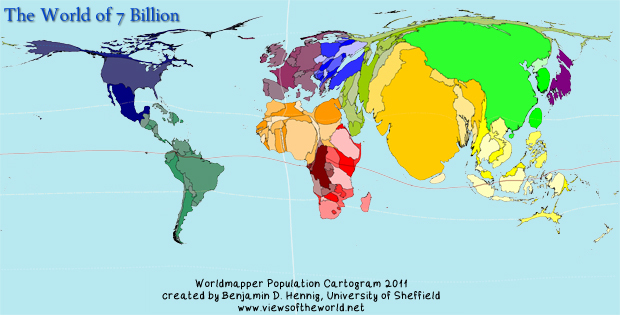 We have mapped the world's population as it looks this year, and also created an animated series of cartograms that show the changing distribution of the world's population from 1950 to 2100 (using UN population estimates). The United Nations General Assembly declared 2011 as the International Year of Forests (IYF). Worldmapper mapped the forest distribution, forest gains and forest losses look on a global scale for an article in the Natural Inquirer, a school science educational journal. UNfair play is a group of young people who set out to challenge the unfair balance of power in UN climate change negotiations. For the 2010 summit in Cancun/Mexico we created a map for them that shows the delegate sizes from around the world. Worldmapper has made some contribution to the latest release of the Urban Infill series by the Cleveland Urban Design Collaborative. The book Water|Craft has just been released (photo from the official book launch) and is available for purchase from Amazon. 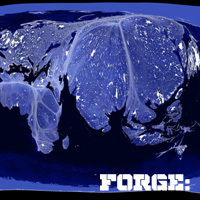 Worldmapper is collaborating with Sheffield-based performance group Third Angel on the project What I Heard About The World. The show will premiere in Sheffield Theatres' Studio May, 29, and then tour in Portugal, in autumn 2010. Further dates in 2011. More information can also be found on the Third Angel blog at thirdangeluk.blogspot.com. Klimatmagasinet Effekt magazine from Sweden used a worldmapper map to illustrate the location of their stories in the contents page in issue 2/2010. 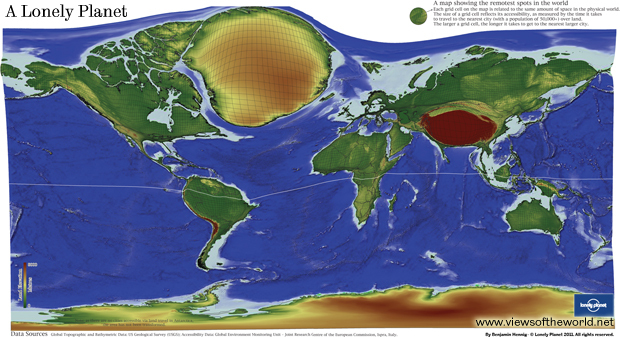 The SaSI Research Group, which stands behind worldmapper, started to assemble a repository of some lectures and talks on SlideShare, also featuring some slideshows with worldmapper maps. 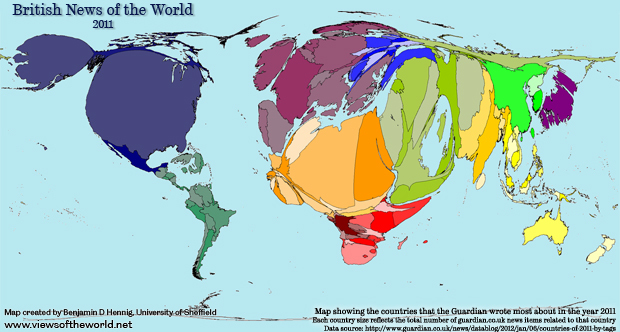 We added a new series of maps which show grid-based cartograms showing each territory shape according to its population distribution. 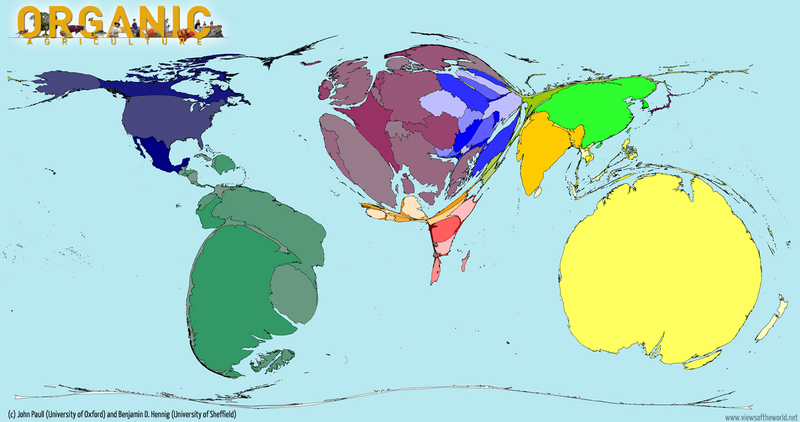 Those can be found at our new Country Cartograms. The territories can be selected via an interactive map or over a list of the new maps. The description of the techniques and data used in our new maps are decribed here. The first six maps now allow you to zoom and click territories for information. The interactive maps use SVG. If you are using Internet Explorer, you will probably need the Abobe SVG plugin. 366 digitally modified maps – known as cartograms – depict the areas and countries of the world not by their physical size, but by their demographic importance on a vast range of subjects ranging from population, health, wealth and occupation to how many toys we import and who's eating their vegetables. We have made 300 dpi TIFF files available of each map. These are intended for non-commercial use. Please see the page on copyright for more details. 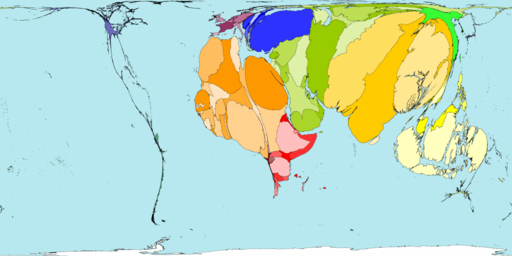 There is a new series of Worldmapper maps available on the subject of Religion. 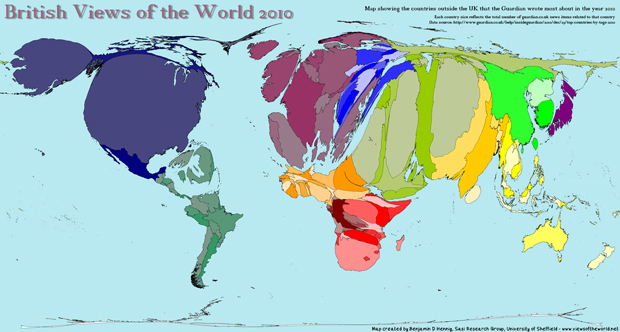 The maps use data from the World Christian Database. This series does not have the accompanying PDF posters that were available with the first 366 maps. 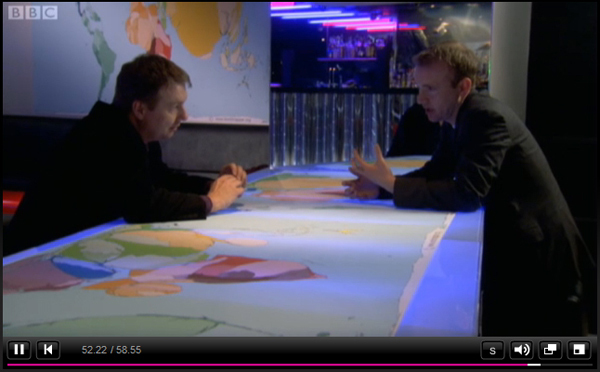 We have created an animation from twelve of the static Worldmapper images, to be displayed at the Millennium Galleries in Sheffield, in an exhibition entitled On the Map, from the 19th January 2008. 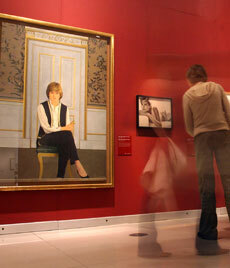 The exhibition is free, and open until 15th June 2008. The animation is also available to view from the link below. Please note it is a large file (14MB), and requires Flash Player. We hope to make a smaller, animated gif version available soon. 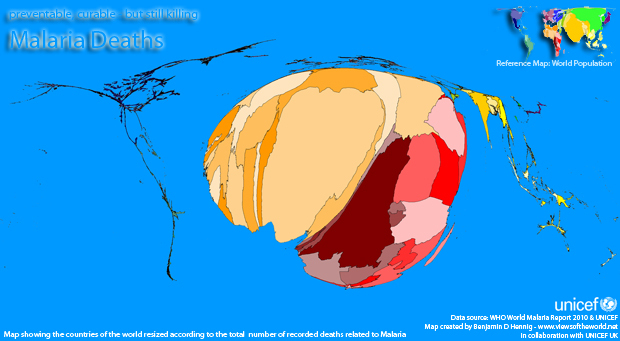 There is a new series of Worldmapper maps available on the subject of Age of Death. 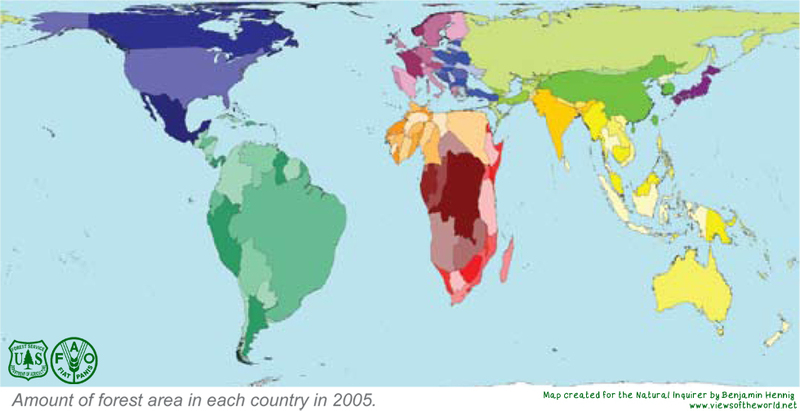 The maps use data from the World Health Organisation's (WHO) Global Burden of Disease (GBD) statistics for 2001. This series does not have the accompanying PDF posters that were available with the first 366 maps. The data files on which they were based will be available soon. 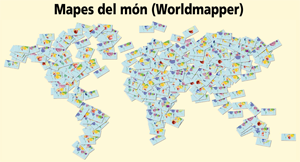 There is a new series of Worldmapper maps (118 in all!) available on the subject of Cause of Death. 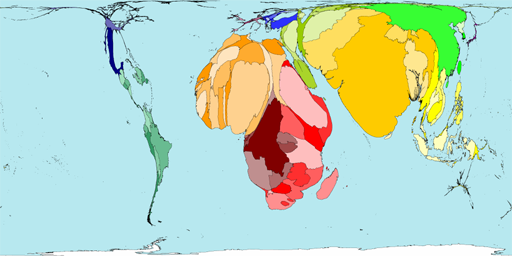 The maps use data from the World Health Organisation's (WHO) Global Burden of Disease (GBD) statistics on death and disability worldwide in 2002. 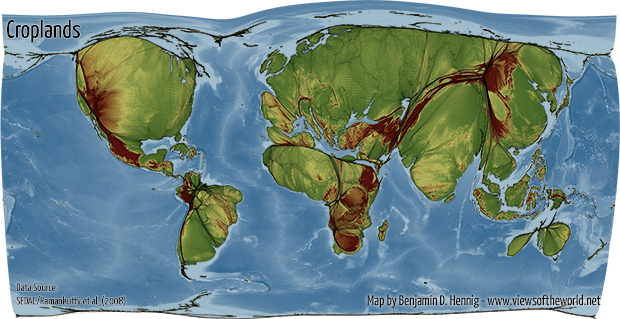 A huge debt of gratitude is owen to David Dorling for his contribution to this series (and Worldmapper in general); these revealing maps, and especially the information that goes with them, would not have been possible with out him. 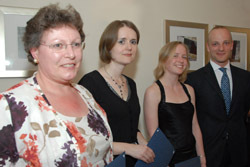 Thanks also to Anna Barford, who put many hours of work into this series before she left the project to start her PhD. This series do not have the accompanying PDF posters that were available with the first 366 maps. The data files on which they were based will be available soon. Anna Barford has worked full-time on the Worldmapper project for two years, writing the information that accompanies the maps, promoting Worldmapper, and doing many other things besides. In October 2007, she leaves the project to begin a PhD. The Worldmapper team would like to thank her for all of her hard work and professionalism she has made a huge contribution to the project. To mark the occasion, we have asked Anna a few questions about her experiences with Worldmapper (link below). 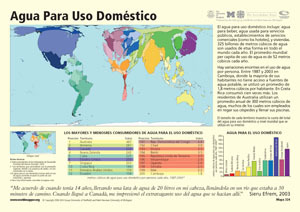 Four Worldmapper PDF posters, all relating to water resources, have been translated into Spanish for us by Ana Lopez Garcia and Ethel Pirola Igoa. Further Spanish posters may become available in the future, and we are also going to add posters translated into Chinese in the near future. 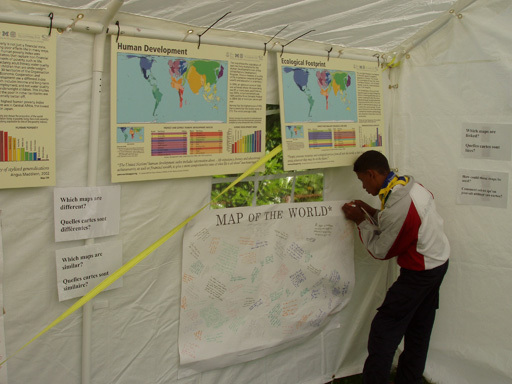 A Worldmapper map of Scouts is on display at the 21st World Scout Jamboree, along with several other Worldmapper maps relating to the UN Millennium Development Goals (MDGs). 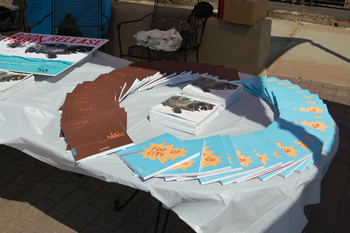 The maps have been used in an interactive stand in the Global Development Boulevard area. The activity, which involved responding to the variety of maps, has raised a lot interest. 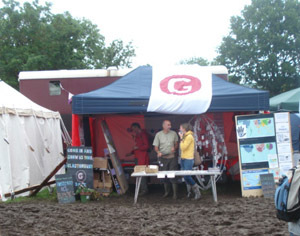 The Jamboree is being attended by over 32,000 young persons and 12,000 leaders and staff from over 150 countries, as well as up to 10,000 visitors daily. Click on the scout map for a bigger version. The full poster version, together with the data, will be available at a later date. Thanks to Robert Lang for the scout data which he obtained from the World Scout Bureau scouting census 2005. 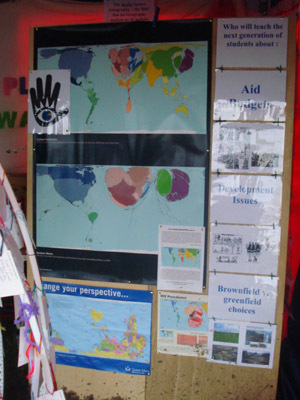 Worldmapper posters depicting nuclear waste, carbon emissions and HIV/AIDS were displayed at the recent Glastonbury festival. They were used as part of the 'Give Geography its Place' campaign. The photos were taken by Daniel Raven-Ellison, one of the campaign members. A new report from ActionAid, entitled Merkel’s moment: The G8’s credibility test on Africa, has been released, and contains Worldmapper maps. The report calls for G8 leaders at the forthcoming summit to honour the commitments made at the 2005 summit in Gleneagles of increased aid to Africa. 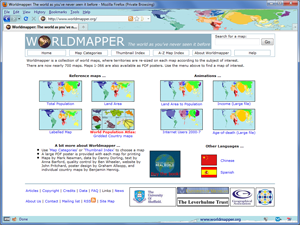 Four of the datafiles that are a souce of the data for many of the Worldmapper maps have been made available on the website. They show original data, and the calculations required to provide the data necessary to make the maps. They can be found under the heading 'Larger Underlying Data Files' on the data page. Maps commisioned by David Aplin, of the National Botanic Garden of Belgium, have been added to Worldmapper. They are botanical gardens, plant species, and the ratio of the two. We have added an animation, which shows the Land Area map morphing to the Population map (it can also be viewed in the opposite direction). It is likely that more of these animations, showing different maps, will be added in the coming months. Did you attend an anti-war demonstration in February 2003? After a lot of research on the web, we have records of demonstrations, and estimates of demonstrators numbers, for many towns and cities. However, we would like to improve the dataset and the map, so we are asking for people who attended a demonstration on the weekend of 14/15/16 February 2003 to check this list to see whether the demonstration that they attended is listed, and get in touch if not. 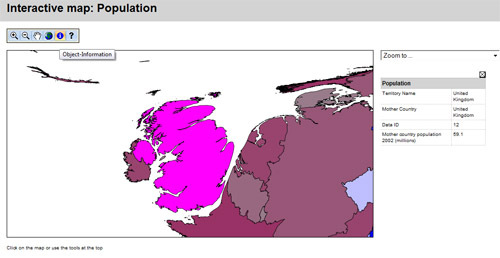 Congratulations to Worldmapper team members Anna Barford and Danny Dorling, who recently received an award from the Geographical Association in the UK, for an article they wrote about Worldmapper for Teaching Geography. Maps 357-366 have been added. You can get to them through the thumbnail Map index pages, or the category lists - the new maps fall into the category of 'Action'. Please note that errors may be present in the new maps and associated text and files, so they may be subject to change. 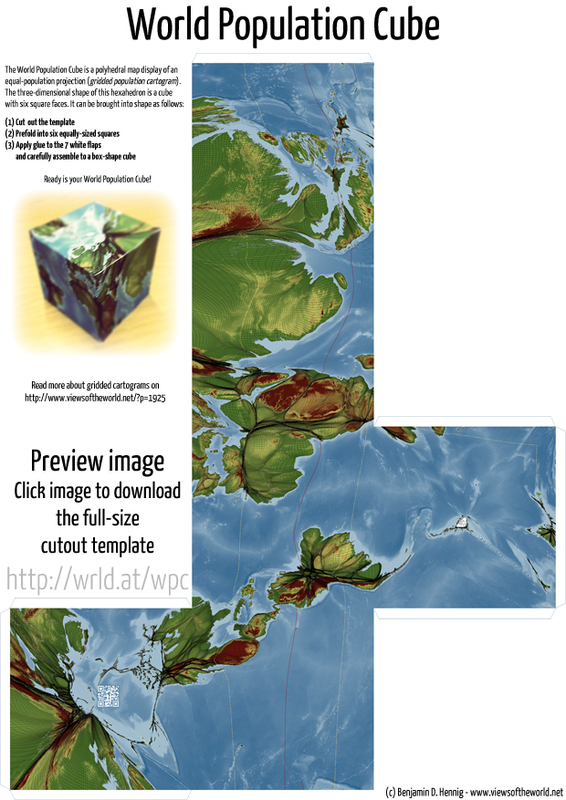 This is the last of the 366 maps in our main series. Technical notes for the later categories will be added soon. Girls not at Secondary School map painted! Several Worldmapper maps accompanied an article on Worldmapper in The Times newspaper today, covering three pages. The full article will be available soon, and a link to the article on The Times website is below. Maps Delayed ... New target set! We have again missed out target for finishing the 366 maps. This is due to the data in the later series of maps being more difficult to work with than we expected. 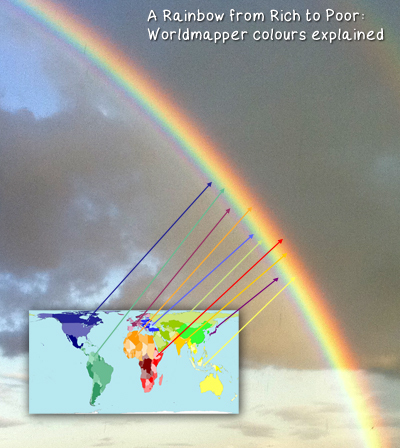 We now aim to finish the 366 maps by 21st March: International Anti-racism Day. Some of the categories should be appearing over the next few weeks. overcome the problems in this world." You can also use our RSS Feed to be notified automatically when we post new maps.